Mission bell on the street in front of Blossom Hill station, south San Jose. Many years ago, these were put up to mark the route of the California mission road, El Camino Real, which runs from Baja California in Mexico up to somewhere north of San Francisco. 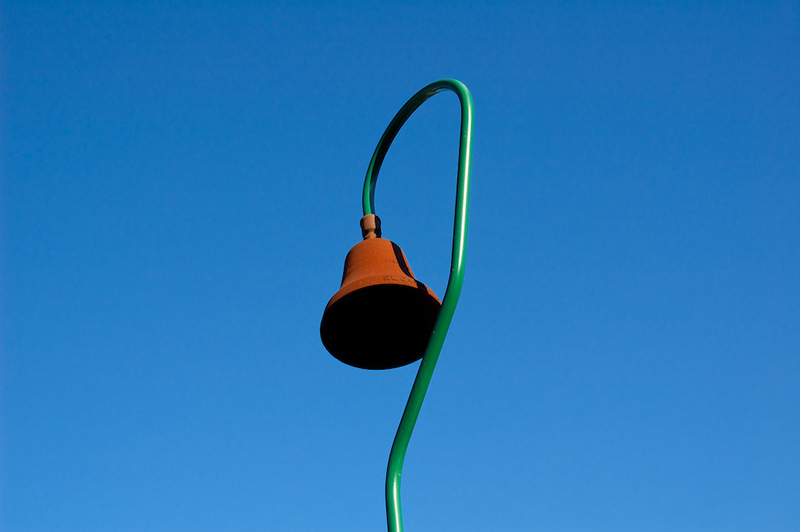 You used to see these bells all up and down the state, but very few now remain. The Caltrain/Union Pacific tracks in southern Santa Clara County parallel Monterey Highway, which follows the route of the historic road in that part of the state. Shot with the Nikon D70s and the 18-70mm f/3.5-4.5 zoom at 31mm, ISO 400, f/10, shutter 1/250 sec. Contrast, highlights, shadows, and levels adjustments in Aperture.